My iPad Pro arrived this past week to my excitement. I have used it for just a few days now at this point. There are absolutely no regrets about this large purchase (I joked that it did cost exactly half of what I paid for my first car!). I am thoroughly impressed by this device. The larger size of this iPad gives it a new device feeling, as opposed to just a refreshed model of the same dimensions. I hope to do a series of posts outlining my use of the iPad Pro. This first post will just outline some initial thoughts on the device, and who I think it is best suited for. Readers of this blog will know that I’m a huge supporter of using iPads for content creation as opposed to just content consumption. 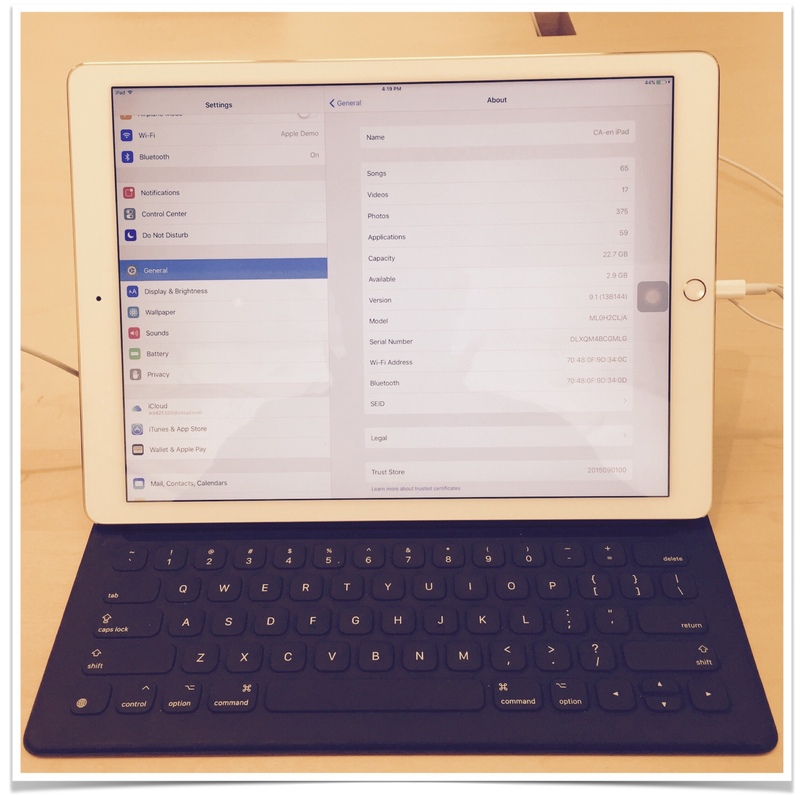 The iPad Pro, along with the new features of iOS 9, bring with it many more possibilities of doing so. The bigger display will be good for primary classrooms while students are on the carpet. For obvious reasons, the larger screen will be easier for all students to see. Hooking it up to a projector will yield the same results as its smaller siblings, notwithstanding being able to use split screens to use two apps at once (also available on the iPad mini 4 and iPad Air 2). Any teacher who already has used an iPad to teach will appreciate what improvements the Pro can bring, not only in its physical attributes, but also in its software improvements. Personally, as a travelling teacher without a classroom, I’m not sure if I will be toting my iPad Pro to all my fourteen different classes. 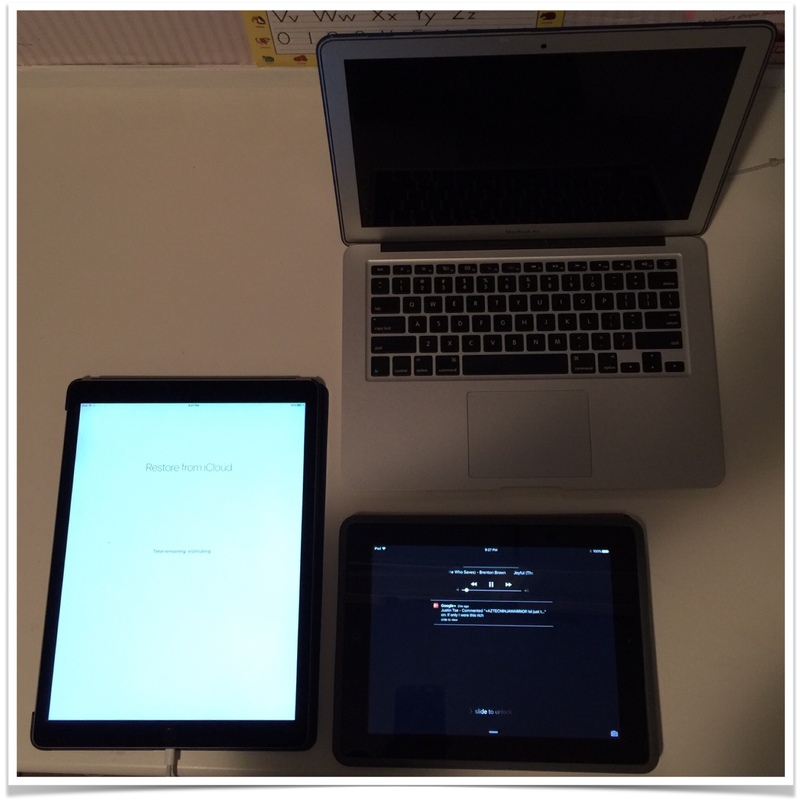 I will continue using my school-issued iPad 4, and will determine if switching over is necessary. Over time, however, I do see myself taking advantage of the many improvements of the Pro, being three full generations newer than the iPad 4. Inputting marks this week on the iPad Pro has been very easy. I open up my markbook on Numbers and have Safari as the split screen to input grades on our school online web sytem. Another example of using Split Screen would be for presentations. Instead of using PowerPoint's presentation notes, teachers/lecturers can have their original documents (in MS Word, for example) open at the same time. The iPad Pro, for most, will not be able to replace your laptop. Although Tim Cook did say that he only works and travels with his iPhone and iPad Pro, those who do intensive work on their laptops (Photoshop, Final Cut Pro, etc.) will not be able to match their productivity on the iPad Pro. Some of us who are “light” MacBook users (email, MS Office, some photo and video editing) will do just fine using just the iPad. People use their laptops in many different ways; not everyone does the same things on their laptops. 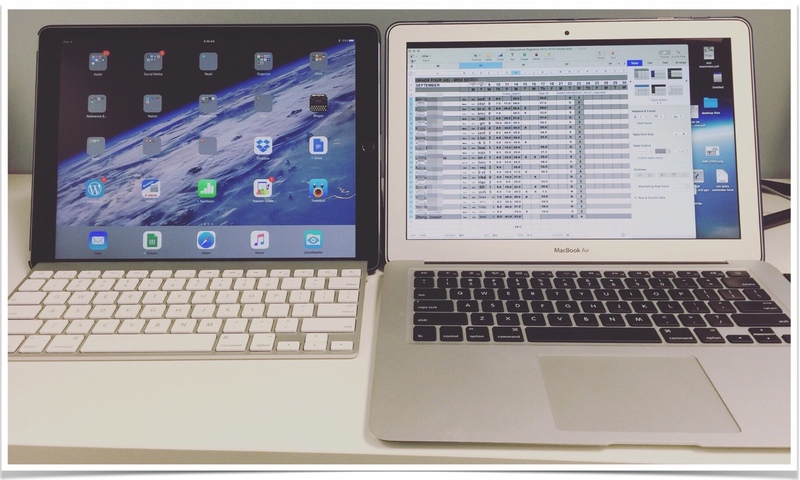 In my particular case, the display on the iPad Pro blows that of the MacBook Air out of the water. No contest in that regard. I plan to leave my MacBook Air at home the next few weeks. I will keep you updated if this experiment works. For what I use my MacBook Air at work, I don't foresee any issues. Two new accessories give the iPad Pro more functionality. While not the most affordable, these two products will enhance your productivity. Without a doubt, the new iPad pro smart keyboard is expensive. It doubles up as a front smart cover, and has received mixed reviews. The keys on it are thin, very much like those on the new MacBook. The keyboard movement is minimal, and will take some getting used to. I won’t deny that this keyboard is sleek and solidly built, but the price is what is stopping me from purchasing it. For me, my Apple Bluetooth keyboard that I already owned (sitting in a drawer, no less) has been good enough for the time being. I am typing this post on the Bluetooth keyboard right now, and it is responsive enough for me. The onscreen keyboard also, works perfectly fine for writing shorter lengths, and is essentially the same size as its physical counterpart. 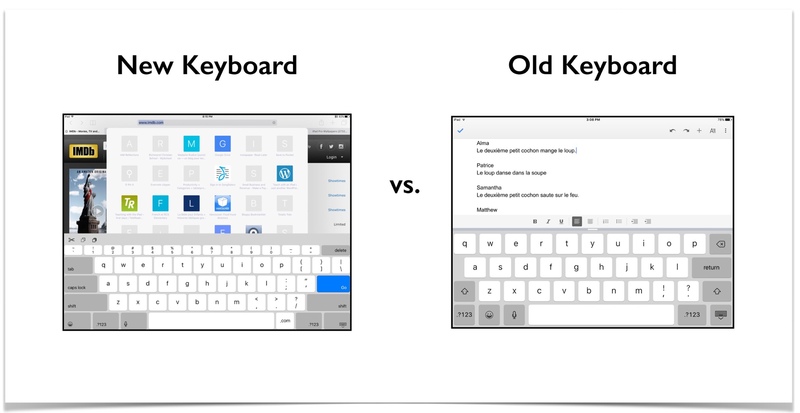 However, third-party apps will resort to a larger version of the original iPad onscreen keyboard. I'm looking forward to a future software fix that will allow the new keyboard on all apps. Professional artists have praised the Apple Pencil. It is not just a stylus. It has amazing palm rejection. Its pressure sensitivity is second to none. As someone who has some interest in art and drawing, I plan to explore creating Sketchnotes, and the Apple Pencil, along with the larger screen real estate will be exciting. The iPad Pro is definitely not for everyone. It will fill a niche market of users. Microsoft users will always prefer the Surface Pro 4. I read through dozens of comments stating that the Surface Pro 4 is better. This is probably true for people who use Microsoft products. These people will never be convinced to switch to iPad. However, personally, I definitely feel excited once again to use my iPad, both at work and at home. All the excellent tools and specific apps that I have shared here on teachingwithipad.org are enhanced with the larger and faster device. For me, using the multitude of amazing apps definitely trumps using more expensive software for the Mac. In all the ways I used my iPad 4, the iPad Pro will just complete those tasks that much better and faster. I look forward to exploring even more ways to use it. I am also excited to try the Apple Pencil, as it looks like it has a lot of potential. Much like when I upgraded to the iPhone 6 Plus last year, I have no reservations about the larger screen size. I have already gotten used to it even after just five days. Although I do promote creation vs. consumption on iPads, reading websites and watching videos on the iPad Pro is an excellent experience as well. The iPad Pro is an excellent companion to bring along on trips, be they for business or pleasure. YouTube and NetFlix videos are crisp, and the audio, with four stereo speakers, is much better than the previous models. The old iPad 4 now feels abnormally small every time I pick it up. Amazing what a few days using a new device can do. 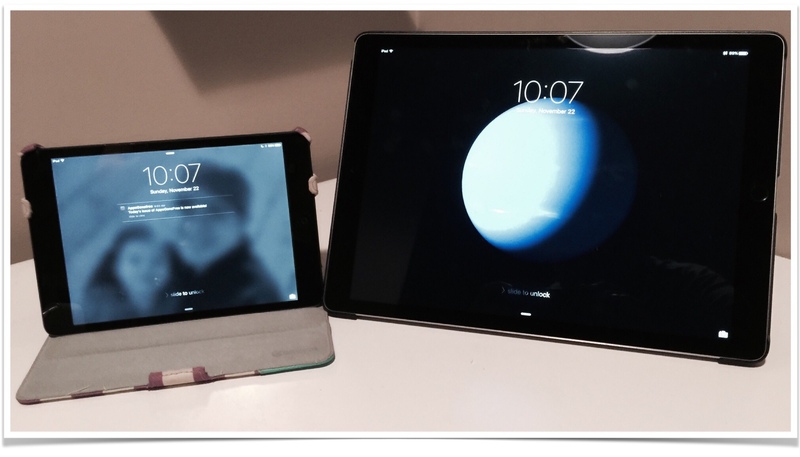 Check out my colleague Jonathan Wylie’s post which explains the difference between two of the best features of the newest iPads, Slide Over and Split View. You must check out Sylvia Duckworth’s collection of Sketchnotes here if you are an educator. Can you imagine how great future ones of hers would be with the Apple Pencil? 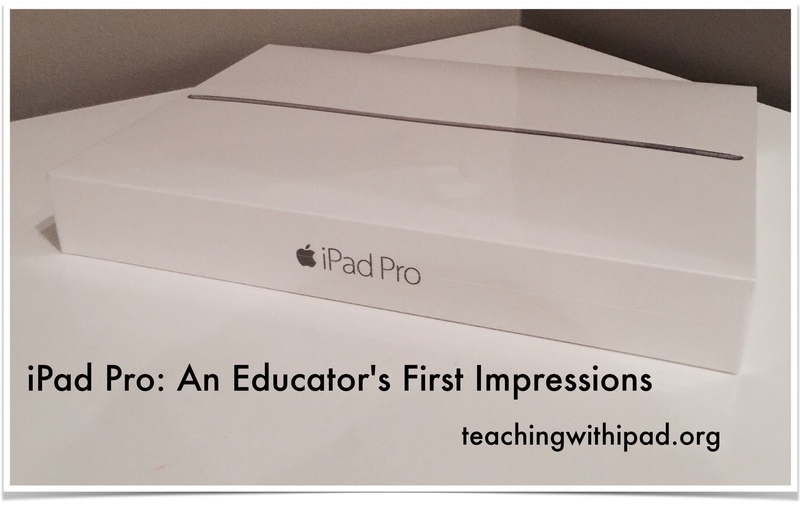 Do you have the iPad Pro? What improvements has it made in your everyday workflow and teaching? On the contrary, do you teach with the Microsoft Surface Pro 4? We would love to hear from you too! Please let us know in the comments! I just got one too. So far I am very happy. I haven’t been able to use it much in the classroom yet, as there was a network issue when we were trying to set up the apple tv in my room. But I am excited to get it going. OneDrive. All the stuff that I’ve been working on and creating over the past few years can be accessed and used relatively easily. Especially my OneNote files, which I use a lot. I don’t know that I could move away from using my PC primarily yet, but it’s awesome that I can easily use and write on the stuff I’ve made or am making. The pencil works awesome so far, although it would be nice if it had a built in eraser feature. The display is great, as is the sound. I also really like the thumb print unlock feature, which may not be unique to this device, but means I don’t have to punch in my pin in front of other people (especially students). Sticking the pencil into the ipad for charging seems sketchy to me. I could easily see people bumping into it and either knocking the ipad off the table or breaking the pencil. The aspect ratio seems a little more 4:3 than 16:9. My projection is pretty much built around 16:9, so not using the entire surface to me always feels like wasting space. Other than that, I am pretty excited. I really want to get using TouchCast, who were at ISTE. While they have have a PC version, they seem to be really built around Ipad. Awesome Aaron! Thanks for the comment! You got the Pencil too?